You might probably like the software Quick Res for Windows XP if you regularly have to change the resolution of the operating system. If you change the resolution manually you have to navigate through a series of menus to finally come to the point where you can select the new resolution for the system. Once you want to change it again you have to go into that menu again to do so unless you keep it open all the time which is probably not such a handy solution. QuickRes comes to the rescue. It adds an icon to the Windows System Tray that provides right-click access to all compatible monitor resolutions that can be changed with just another click. The user selects a resolution and a click on the refresh rate changes the resolution to the selected one. It is advised to make sure that Windows is only displaying compatible modes in the Display Properties because that's the source where QuickRes is pulling the information from and it can come to errors if resolutions are selected that the monitor or video card are not capable of displaying properly. Don’t know why anyone would need these resolution control softwares. I have an Nvidia based card and there is a tray app called Nvidia Settings that allows on the fly resolution changing. Why run extra software when you don’t need it? MultiRes is similar to QuickRes. Take a look at it for comparison. U shouldn’t think that everyone have Nvidia VGA card..
this tool is very helpful PC owner who doesn’t hav any resolution changer tool. 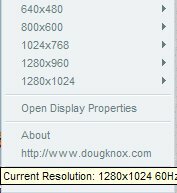 on my CPanel.. there’re only few resolution size options.. I usually change resolution through Nvidia control panel since there are many useful setting saved there like refrsh rate and 3d acceleration.